New !! A weekly Forecast ! Vagaries Sunday Weather Forecast for the Week: 8th -15th January. 1. J-1 Moves away on Sunday. Decrease in rainfall from Northern regions. Expected to cover Nepal on Sunday/Monday. Major fog in Northern plains on Monday/Tuesday. 2. 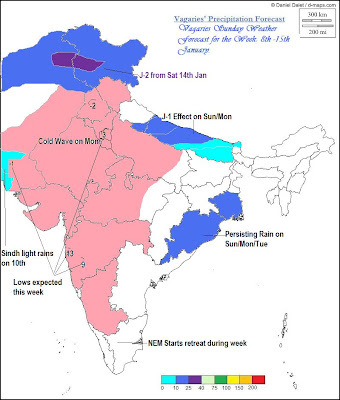 Persisting Rain over Orissa on Sunday and Monday. 3. Projected weak W.D. from Tuesday,10th staggers, but due to secondary, Sindh Pakistan will get light rains on 10/11th. 4. Next major W.D, (J-2) on Northern regions from Saturday,14th. 5. 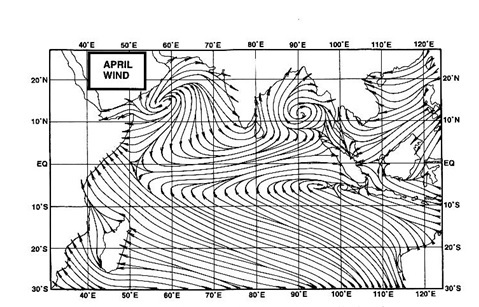 Cold Wave likely over Plains of NW, Western and Central India and Sindh Pakistan on Monday and Tuesday. 6. NEM likely to start retreat this week. Hindustan Times reporting that Punjab's Pathankot district received snowfall on satureday- first time in more than 40 years. And this weekly weather forecast is good initiative. the weekly forecast idea is good, but i hope this will not replace yoru periodic updates. In due coarse of tym its no wonder that delhi and chandigarh get a snowfal.sir pl specify d parameter fr a smwfal and which areas can get it. Dos altitude matters? Snow forms when the atmospheric temperature is at or below freezing, 0c, and there is a minimum amount of moisture in the air. If the ground temperature is at or below freezing, of course the snow will reach the ground. However, the snow can still reach the ground when the ground temperature is above freezing if the conditions are just right. In this case, snowflakes will begin to melt as they reach this warmer temperature layer; As a general rule, though, snow will not form if the ground temperature is above 2c. Snow forms in the atmosphere, not at the surface. So snow can fall when surface temperatures are above freezing upto 2c and as long as atmospheric temperatures are below freezing and the air contains a minimum moisture level (the exact level varies according to temperature). "The WD is passing over Kathmandu now. Overcast skies. but its not raining. I guess the WD is weakening and breaking up over eastern nepal now . (??) and in your blog i could find few interesting observations, it seems there was a freak snowfall event in lower Himanchal pradesh including Kangra which is merely 2500 ft above sea level; it shouldn't normally snow there. And from what i have heard from the older generation people here, around that time, some 66 yrs ago, it snowed heavily in Kathmandu too; trees falling down, branches breaking off ; due to the load of accumulated snow. nothing like that has happened since; though there were two very light snowfall events in 2007, and 2010 and few other events before that: but all were mere dusting of snow rather than any significant snowfall."